Orchidelirium is the name the Victorians gave to the flower madness that is for botanical collectors the equivalent of gold fever. 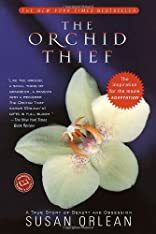 Wealthy orchid fanatics of that era sent explorers (heavily armed, more to protect themselves against other orchid seekers than against hostile natives or wild animals) to unmapped territories in search of new varieties of Cattleya and Paphiopedilum. As knowledge of the family Orchidaceae grew to encompass the currently more than 60,000 species and over 100,000 hybrids, orchidelirium might have been expected to go the way of Dutch tulip mania. Yet, as journalist Susan Orlean found out, there still exists a vein of orchid madness strong enough to inspire larceny among collectors.